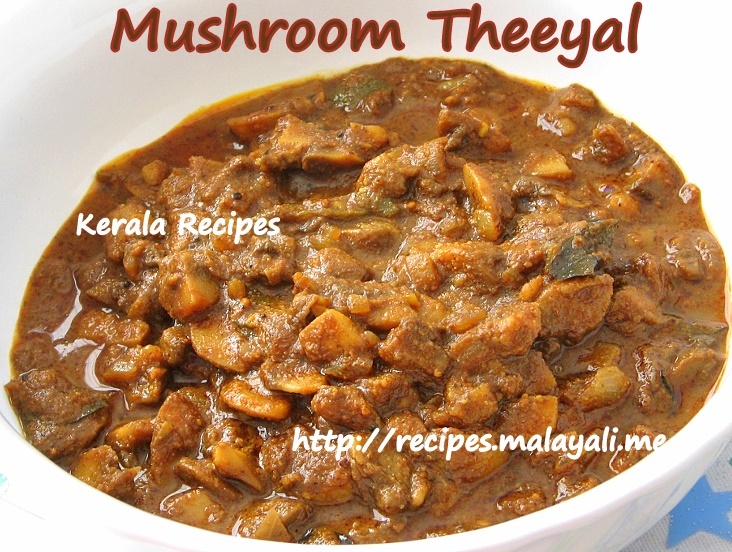 Here is the recipe for Mushroom Theeyal or Varutharacha Mushroom Curry. All Mushroom lovers should try out this recipe. 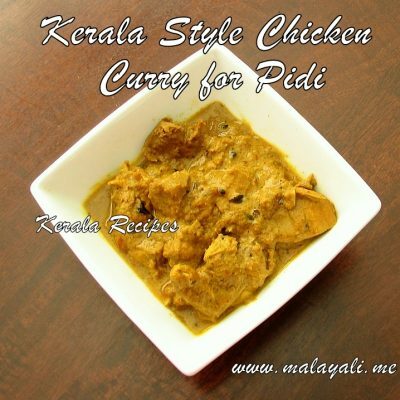 It tastes as good as any non-vegetarian curry. Don’t be surprised if you mistake it for Beef Curry. 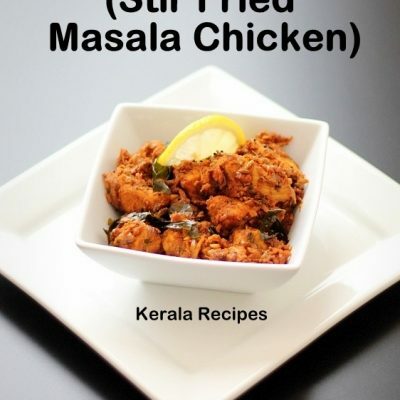 The recipe is similar to Vegetable Theeyal except that I have used Garam Masala Powder and Meat Masala Powder. Wash and drain the mushrooms and cut it into bite sized pieces. Rub little salt and 1/2 tsp turmeric powder on the mushrooms and keep it aside. Soak tamarind in 1/2 cup warm water for some time and extract the juice and keep aside. Meanwhile dry roast coconut, shallots, garlic and curry leaves on medium-low heat. Keep on stirring continuously until the coconut turns into a dark brown color. The coconut should be thoroughly roasted till it’s almost burnt. Reduce heat and add turmeric, coriander, red chilly and garam masala powders and continue roasting for 2 more minutes. Remove from heat and allow it to cool. Saute onions, slit green chillies and curry leaves until the onions are translucent. Next add 1 tbsp meat masala powder and 1/2 tsp black pepper powder and stir fry for a minute. Add the marinated mushrooms and mix everything well. Cover and cook for around 5-7 minutes. The mushrooms would have let out water by now. Add the ground coconut paste to the pan along with more water and salt. Simmer on medium flame for 5 minutes. Add tamarind juice and bring everything to a slow boil. Sprinkle more garam masala if required. Reduce flame and simmer until the gravy thickens. This Mushroom Theeyal goes well with Rice. You can alter the consistency of the gravy by increasing or decreasing water content. If using tamarind paste, adjust the sourness accordingly. 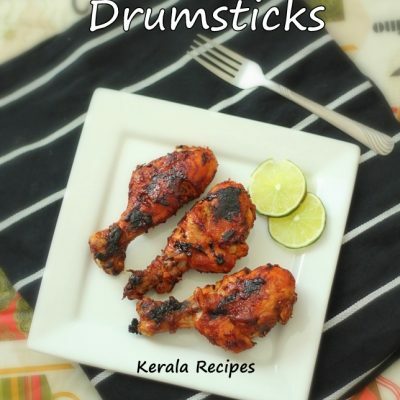 The color of Theeyal depends on how well you roast the coconut and spices. If you have Ready Made Coconut Varutharacha Gravy like Saras brand, you can make this curry easily. 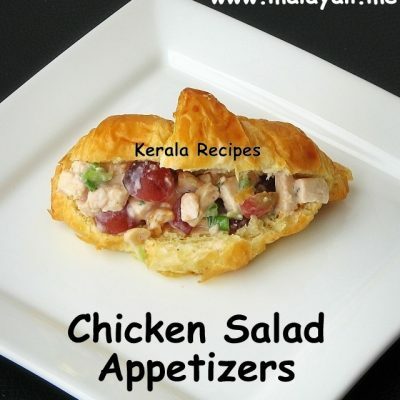 never tried theeyal w/ mushrooms… looks yummy! 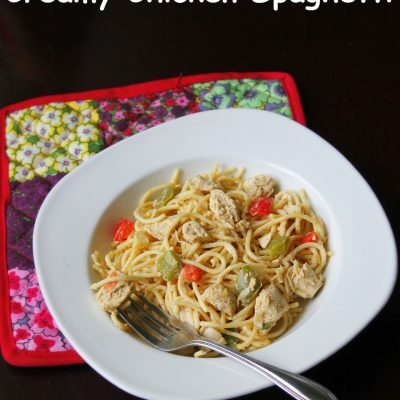 WAS LOVELY…THANX FOR A GR8 RECIPE!! It was fantastic. My family liked it.